There are some things that just scream SUMMER!!! Yeah, I know we're just barely into Spring right now, but I had a Spring/Summer Lemongrass Spa launch party this past weekend and I wanted something that screamed SUMMER!!! To me, two of the things that scream Summer are hotdogs and barbecue. 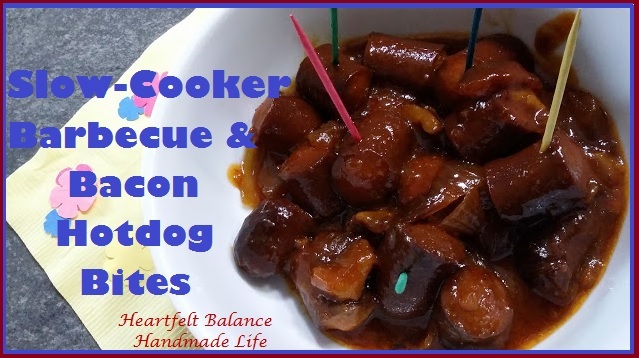 When the days get longer and people begin to use their grill more often, hot dogs come to mind. I LOVE a good beef hotdog when I haven't had one in forever. Another thing that's about to be back that reminds me of hotdogs? Baseball games. . . . . who hasn't gone to a baseball game and eaten 3 $1 dogs? Just me? Really? Summer is really the only time of year that I usually even think about hotdogs. I've done these Barbecue & Bacon Hotdog Bites several times now. We love them. Now I know this isn't a healthy meal. This is the thing. . . . . . . . . we don't make or eat these all the time. Life is about balance. Getting healthy and staying healthy is about balance. Usually when you make this, it would be for a party, as an appetizer. . . . . . not a "meal" anyway. Get a couple of these and fill the rest of your plate up with the veggie tray items, fruit, whole grain crackers. . . . balance, people. 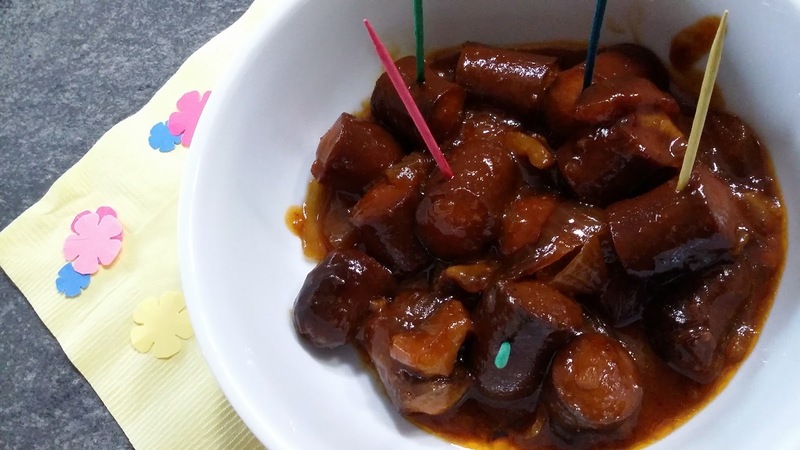 I've made these before and I really, usually just grab a random barbecue sauce. 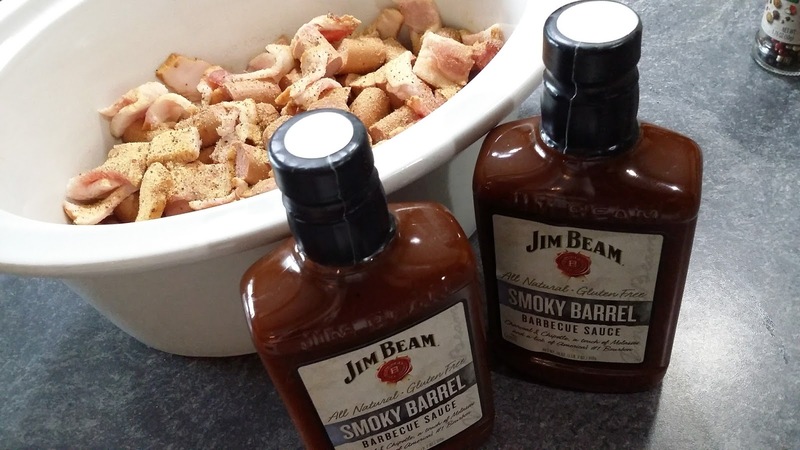 This time I grabbed two bottles of Jim Beam Smoky Barrel Barbecue Sauce. I was drawn to it because the label said "All Natural." Now normally, this would make a lot of sense in my life. I'm trying to go "All Natural." So, it's kind of silly and ironic that I combined it with hot dogs and bacon. Of course you could use Kosher or nitrate-free hot dogs and nitrate free bacon to make this a little bit better. Just sayin'. If that's a thing you'd want to do. I was not disappointed with the barbecue sauce. It really had a kick and I love spicy food. 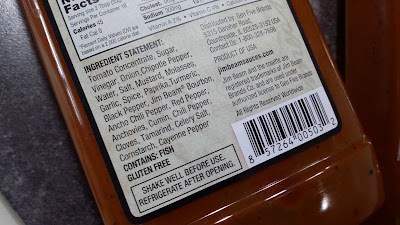 It has Chipotle Pepper, Ancho Chili Pepper, Chili Pepper and Cayenne Pepper in the ingredients list. Hooooeeeee! I am glad I found this barbecue sauce. 🌶🌶🌶🌶 What was a quick grab at the local grocery store might turn into my favorite sauce this Summer. Hopefully I'll be able to find it again. 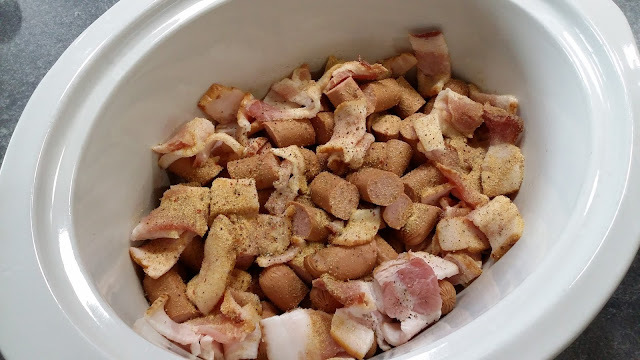 Here is how I made the Slow Cooker Barbecue and Bacon Hotdog Bites. The hardest part was cutting the bacon. . . . and that's not that hard. 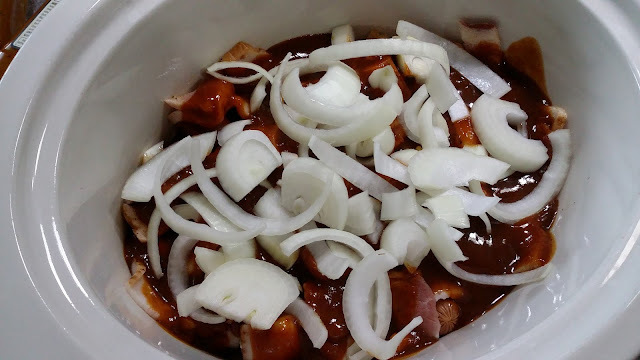 I love using a slow cooker or crock pot for party appetizers, because I can just throw the stuff in the pot and forget about it. That leaves me time to prepare other things. I've had my crock pot for about 13 years now and it's still going strong. I wish I had two. I saw my exact slow cooker crock pot at a garage sale once for $10 and still to this day regret not getting that darn thing! It looked brand new. Note to self: Buy the darn Crockpot next time! 2 packs of your favorite type of hot dog ~~ I'm not gonna lie. . . I just grabbed the most cost-effective beef hotdogs I could find, cut into 1 inch pieces. Cook on low for 4 hours. Can be left on for longer periods of time though. What are your favorite flavors of Summer? Great recipe for our next sports party! Thanks for linking up with Funtastic Friday!